Jodi Eichelberger and Tod Dunnigan lead Boise’s most talented singers and dancers as they reimagine Judy Garland’s one and only televised Christmas Special. Judy invites the TV cameras into her home for this 1963 Christmas TV special, to share the holiday with her family and her good friends as they all informally drop by. 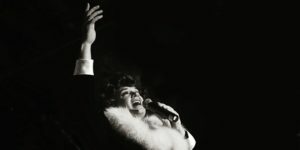 Young Joe and Lorna adorably sing off-key songs, a 17-year old Liza Minnelli is at her best singing and dancing to that classic dance jazz number “Steam Heat”, and Judy belts out her classic songs all under the guise of a warm, family affair. Combining mainstream Christmas rituals and the awkward banter between family on the holidays, this Alley Repertory Theater Christmas Extravaganza will pull on your nostalgic heartstrings and push your funny bone in a way that ONLY Alley Rep. can: by making this Christmas classic irreverent and bittersweet.